A novel doubly focusing neutron monochromator has been developed as part of MACS. 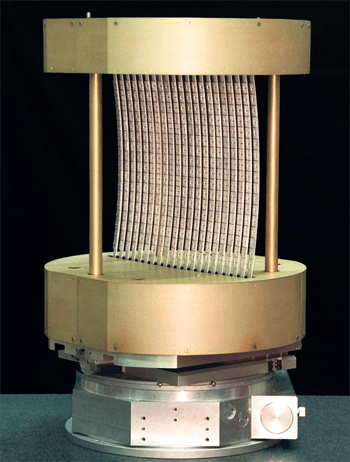 The instrument utilizes a unique vertical focusing element that enables active vertical and horizontal focusing with a large, 357-crystal (1428 cm2), array. The design significantly reduces the amount of structural material in the beam path as compared to similar instruments. Optical measurements verify the excellent focal performance of the device. Mounted at the NIST cold neutron source, the instrument produces a monochromatic beam (DE = 0.2 meV) with flux f > 108 n/cm2/s.